Windows is a very popular operating system developed by Microsoft corporation. Windows OS are used by 80 percent users all over the world. Computer are used in every field to save time and increase work efficiency. Computer world totally changed the human life style. People like to use computers in playing Games, surfing internet, video calling, watching videos and much more. If you also have found of watching videos and looking for best video players then read our previous post best Media players for windows. One reason for using Windows OS is that windows provide application software in different fields. As we know that computer can store large amount of data. It can be our personal data which we do not want to share with anyone. In some situation a single computer is shared by several users. So we need to protect our data from other users. One way to protect our data is that we create a folder and save our data in that folder and protect this folder with a password. So we need folder lock software for windows. If you are a Windows User and want to protect your data then do not worry. 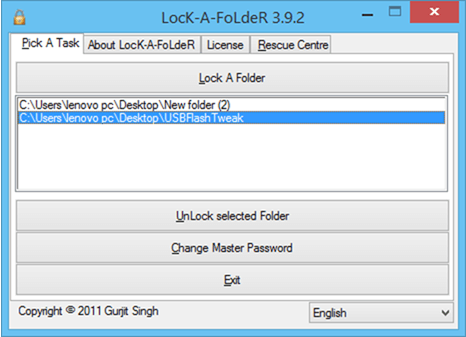 In this article we are going to discuss about best Windows folder lock software. Best Folder Lock Software For Windows. 6. Lock & Hide folder. 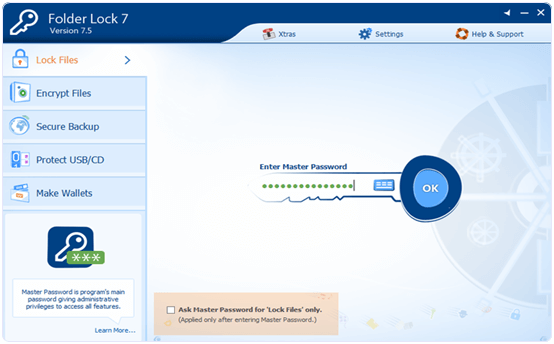 Folder lock is one the amazing files and folder lock software for windows which protect our data from unauthorized access. This software is compatible with Windows 7, 8, 10, XP, Vista etc. It is an easy to use software with attractive GUI. We can also encrypt files and folder. It also provide option to lock our pen drive, hard disk drive etc. One of its Major advantage is that its version trial is freely available. 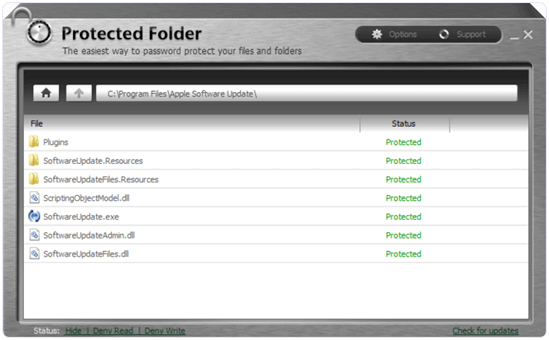 Protected folder is another popular folder lock software for Windows. It is a lite weight software which drop capability. User just only have to drag the file or folder and put it in the security area. It hide the folder from being visible and provide protection from viewing, modifying the data. It is compatible with Windows 7/8. 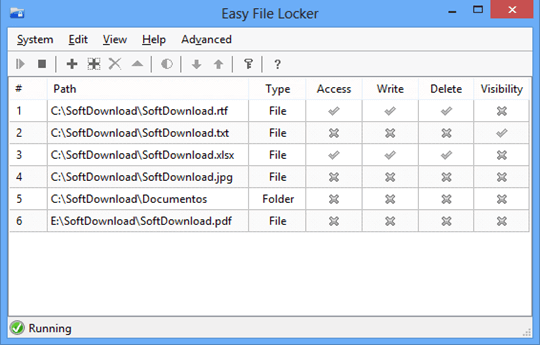 Easy file locker is another popular folder lock software for windows users. One of its maize advantage is that it is freely available for everyone. It is compatible with windows 7, 8, XP, Vista. It is a lite weight application with easy to use GUI. It provide drag drop option and also provide file/ folder browsing option for hiding the file. It prevent the unauthorized user to access, view, modify our personal data. 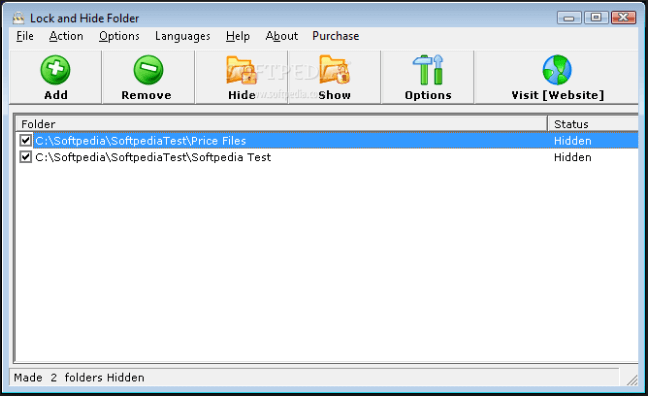 Winmend folder Locker is another freeware folder hiding and locking software for Windows users. It works by hiding files and folder which are completely invisible to other programs and Operating system. We can unhide the files and folder from the software un-hide option. To open the software we have to use the password that we provide at the time of software installation. It ensure that nobody can view your data. It is compatible with windows 7, 8, VISTA. Private folder is another freely available file hider for Windows. It is available for both 32 and 64 bit version. We can hide or lock a number of files in this application. It provide a special feature if the name of container folder is changed then the hidden files inside the folder will also remain hidden. It is best app for home users without any cost. It is compatible with windows 7, 8, vista. Lock and hide folder is another folder lock software for windows for free. It can only lock the folder but can not lock file. It provide 256 bit encryption for hiding folder. You Can hide or un-hide the folder just in one click. It is compatible with windows7, 8. It is good for home users. This tool has less features but if you only want to hide the directories then it is good tool for hiding the directories. SecretFolder is a simple and easy to use utility software that lets you hide your folders and their contents very easily. The best thing this simple tool offers is that it cannot be uninstalled without entering the password. This means maximum security. The interface is so simple and effective that anyone can use this software. HiddenDIR is yet another tool that can help you to hide your folders on a windows OS desktop. It also uses a password protected security system which is very convenient to use. The best thing about this little tool is that it has a very polished and well built interface that adds to a great user experience. 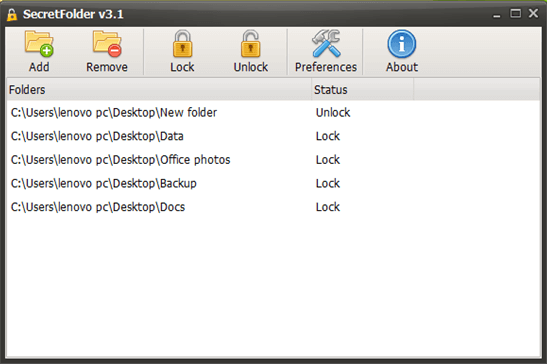 Lock a Folder is a free folder lock software for windows OS that users can simply use to hide their secret files. This tool offers a master password so there can be no unauthorised uninstallations and your data is very safe if you are using this tool. Unfortunately, this project has been abandoned that means there won’t be any further updates offered by the developer. 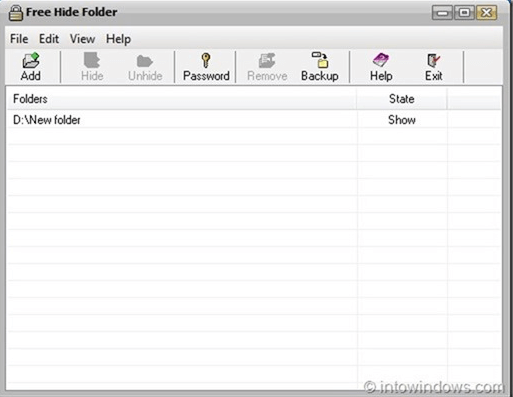 Free Hide Folder is a very basic and minimalist tool to hide files and folders in Windows OS. You can give it a try by downloading it from the link given below. In conclusion, we hope that you find the above given best folder lock software for windows useful. Share your thoughts and experiences in comments below.